Despite two consecutive losing seasons, Texas closed strong on national signing day with a surge of defensive talent that put its recruiting class among the nation's best. Longhorns coach Charlie Strong clearly sold a promise of good things to come at a program that is just 11-14 the last two seasons. And the payoff came in the final hours with a tidal wave of commitments from recruits who had kept quiet about their choice of school until Wednesday. Headlining the defensive haul were Brandon Jones, one of the nation's top-rated safeties, and defensive tackles Chris Daniels and Jordan Elliot among the 24 players who signed with the Longhorns. Daniels, of Euless, Texas, had initially committed to Big 12 rival Oklahoma. Texas also signed the state's top quarterback prospect in Shane Buechele of Arlington, who is already enrolled in school and could compete for the starting job as the Longhorns rebuild their offense behind new coordinator Sterlin Gilbert. Perhaps just as important for Strong was the optimism that came with landing so many highly rated prospects on the final day. "It was a great day today. A great finish," Strong said. "This was a big step forward for our program. We needed it. The drama today, I liked it. We needed everyone's attention on our program." Best in class: Brandon Jones, S, Nacogdoches, Texas. Best of the rest: Jeffrey McCollough, LB, Houston; Erick Fowler, LB, Manor, Texas. Late addition: Jordan Elliott, DT, Houston. One that got away: Patrick Hudson, OL, Silsbee, Texas, who stuck with his early commitment to Baylor. How they'll fit in: The Longhorns had two significant needs, defensive tackle and quarterback, and nailed both. Texas' best DT from last season, Hassan Ridgeway, is leaving for the NFL and experienced depth is woefully thin. Daniels (6-4, 328 pounds) and Elliott (6-3, 322) and the three other freshmen tackles will immediately compete for playing time. Jones (6-0, 195) is a big get to help he backside of a defense in the pass-happy Big 12. "We knew we had to shore it up on defense," Strong said. "We had to get guys inside ... Big body guys. That's how you win." Buechele (6-1, 190) will have his chance to take over at quarterback. His competition is senior Tyrone Swoopes and sophomore Jerrod Heard, who have struggled. HOUSTON (AP) - The Houston Cougars will look to build on the success they had in a 13-1 season in the first year under coach Tom Herman with a recruiting class highlighted by five-star defensive tackle Ed Oliver. The Cougars also added another local star in Bellaire, Texas, wide receiver Courtney Lark. The consensus four-star recruit had 68 receptions for 1,222 yards and 18 touchdowns last season to cap a career in which he received first-team, all-district recognition in three straight seasons. Best in class: Ed Oliver, DT, Houston. Best of the rest: Courtney Lark, WR, Bellaire, Texas. Late addition: D'Eriq King, athlete, Manvel, Texas. One that got away: Tyrie Cleveland, WR, Houston. Chose Florida. How they'll fit in: Oliver should start immediately for a defense that will undoubtedly benefit from his size. Rodgers should make the transition to Division I football easily after playing two seasons in junior college and Lark could also see playing time early after the Cougars lost several receivers to graduation. With quarterbacks Kyle Allen and Kyler Murray both transferring from Texas A&M before the bowl game, the Aggies were in need of depth at the position. Texas A&M also added Nick Starkel, who threw for more than 3,000 yards with 29 touchdowns at Argyle, Texas, last season. Another quarterback prospect is Moses Reynolds, a versatile player who ran for almost 1,000 yards with 12 touchdowns and threw for more than 800 with seven scores in 2015 for San Antonio Jay. The younger brother of A&M star receiver Josh Reynolds also had 304 yards receiving with two touchdowns and grabbed three interceptions on defense last year. On defense, the star of the class is McKinney, Texas, defensive end Justin Madubuike. The Aggies also snagged a pair of top cornerbacks in Travon Fuller of Athens, Texas, and Charles Oliver of Fairfield, Texas. Best in class: Kellen Diesch, OL, Trophy Club, Texas. Best of the rest: Clyde Leflore-Chriss, WR, New Orleans. Late addition: Clifford Chattman, S, New Orleans. One that got away: Brandon Jones, S, Nacogdoches, Texas, who chose Texas. How they'll fit in: Coach Kevin Sumlin has long said that he doesn't recruit players to sit on the sidelines, so expect to see many of these players fill big roles this season like freshmen WR Christian Kirk and DL Daylon Mack did in 2015. Baylor has become a consistent winner on the field, with 50 victories the past five seasons along with the Bears' first two Big 12 championships. That is translating into more and more wins in recruiting. Coach Art Briles signed 22 players Wednesday to national letters of intent, including exceptional wide receivers Tren'Davian Dickson and Devin Duvernay for a big-play offense that gets back quarterback Seth Russell. The top-rated FBS passer when he suffered a season-ending neck injury Oct. 24, Russell was cleared this week to resume football activity. Four of Baylor's starting offensive linemen were seniors last season. On the defensive line, there were two senior ends and junior nose tackle Andrew Billings, who is bypassing his senior season for the NFL draft. The Bears signed three highly touted offensive linemen, along with five defensive linemen, in a class Briles called the best Baylor has ever signed. "If you look back to the classes we've signed in the past, they were not this high and we won Big 12 championships," Briles said. "This is a high class. We're going to win Big 12 championships, but we're looking for the national title too." Best in class: Tren'Davian Dickson, WR, Navasota, Texas. Best of the rest: Devin Duvernay, WR, Sachse, Texas; Patrick Hudson, OL, Silsbee, Texas; Kameron Martin, RB, Port Arthur, Texas; Zach Smith, QB, Grandview, Texas. Late addition: Cornerback Parrish Cobb had committed to Oklahoma before his senior season at Waco's La Vega High, but decided to stay at home. He had 56 tackles and four interceptions as La Vega went 16-0 and won a Texas Class 4A state championship. One that got away: Brandon Jones, considered by many to be the nation's top safety, signed with Texas after having Baylor as one of his finalists. How they'll fit in: Dickson, who set a Texas prep record with 76 career TDs receiving, and Duvernay, who Briles called the fastest player he has ever signed, should be able to contribute right away to a receiving corps still loaded even with All-American Corey Coleman bypassing his senior season. Hudson (6-foot-4, 325 pounds) is considered one of the top offensive linemen in the country, filling an immediate need with junior college transfer B.J. Autry (6-3, 320) and local standout J.P Urquidez (6-6, 300) from Copperas Cove. COMMITMENT TRACKER: The scores keep on coming for Texas. Linebacker Jeffrey McCulloch picked the Longhorns over Notre Dame and Stanford. COMMITMENT TRACKER: Linebacker Dontavious Jackson from Texas is heading to Florida State. Charlie Strong and the Texas made a later push to get Jackson, but the Seminoles closed the deal on him. COMMITMENT TRACKER: Deontay Anderson won the day as far as spectacular commitments go. The four-star safety released a video on Bleacher Report of him skydiving, landing and opening up his jump suit to reveal and Ole Miss T-shirt. Houston lost one of its prize commitments when wide receiver Tyrie Cleveland switched his college choice to Florida. The receiver from Houston was rated as the nation's No. 33 prospect in a composite ranking of recruiting websites compiled by 247Sports. 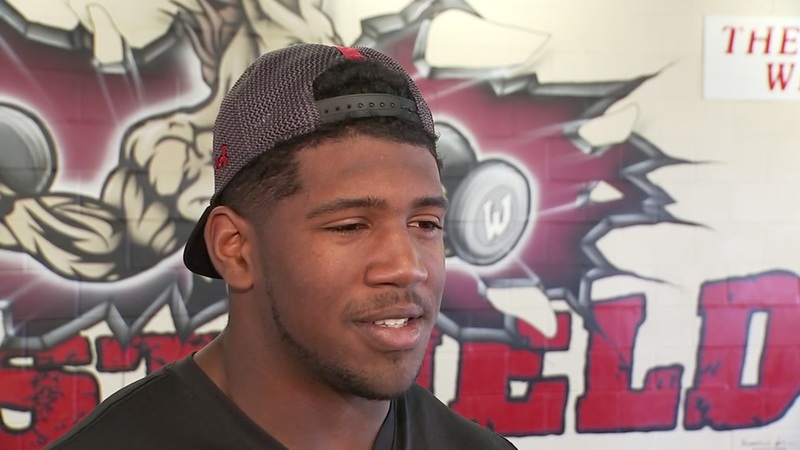 The Cougars did get a signed letter of intent from defensive tackle Ed Oliver, the nation's No. 6 overall recruit according to the 247Sports Composite. The Oliver signing was expected but it's still quite a coup for a program outside the Power 5. Ring up another one for Charlie Strong and Texas: S/LB Brandon Jones, the Lone Star state's defensive player of the year, picked the Longhorns over Texas A&M and Baylor. Say this about Texas coach Charlie Strong: He is a closer. The Longhorns may end up with the highest-rated class in the Big 12. The Longhorns scooped up defensive linemen Chris Daniel and Marcel Southall early Wednesday and D'Andre Christmas-Giles late Tuesday night. The bad news: That surge might not be good enough for Texas to crack the top-10 nationally. It's not just Texas feeling the squeeze with more competition (i.e. the SEC) in-state for top talent. The entire Big 12 is fighting to keep the Lone Star state from being poached.